insights into this "king of a man." Thank you to Zita Ost of HeyZ Radio for her interview on "The Broader View" on December 9, 2013. Thank you to Zita Ost of HeyZ Radio for her interview on "The Broader View" on October 21, 2013. Thank you to Nancy Ferrari for her interview on " The Nancy Ferrari Show" on W4CY Radio, October 15, 2012. Thanks to Heaven Leigh, who wrote great review on her blog. Thanks, Alice D. of Readers Favorite for reviewing my book. Click here to listen to her review. Thank you to Pez Greaves, Editor of Iconic Magazine [published in the U.K.], and his staff for the wonderful review. Thanks to Chris for running the contest for an autographed book through "Michael Jackson BACKSTAGE" in Belgium. Thank you to Theresa Biggerstaff & MJTN (Michael Jackson Truth Now) for the great review. Thank you to Patricia Woods and Books to Mention for featuring Dr. Moriarty. Click here for front page. Click here for Q&A interview. Thank you to Rev Dr Catherine M Gross for the interview "A PLACE IN YOUR HEART ." Thank you to Reverend Barbara Kaufmann for the beautiful review in "Inner Michael." On his MJ website in France, Fabien has endorsed and promoted Defending A King ~ His Life & Legacy. Click here to Read. 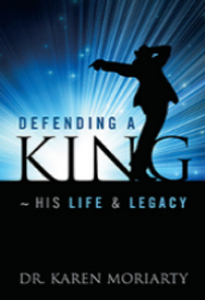 "Defending a King: His Life & Legacy" will leave the reader in a different place at its ending. Even readers who are indifferent to Michael Jackson will be true fans at the end of this book. Author Karen Moriarty takes the reader step by step into Michael Jackson's life and career, convincingly conveying his great musical genius and his inability to deal with the sycophants and cheats who attached themselves to him. As the "King of Pop", his ability to write brilliant songs and dance to their beat could not be matched by anyone else in the music business. But this great talent also made Michael Jackson inept in business dealings. Dr. Moriarty tells of how people who worked for Michael Jackson stole from him right and left. Dr. Moriarty also tells honestly of how Michael never recovered from the horrors of the Neverland 2005 trial and covers his tragic death at the hands of Conrad Murray. Michael was overwhelmed by the lawsuits that came at him incessantly and only wished to have a good night's sleep. Instead, filled with a deadly drug, he died. It becomes clear to the reader that Michael Jackson was a first rate father to his three children, but despite being surrounded by people, he was a lonely, lonely man. Dr. Moriarty speculates that Michael Jackson might have lived if he'd had someone nearby who truly cared about him. She tells that, of his immediate family, he was close only to his mother. Sad! "Defending a King" is one of those rare books that will touch the reader's mind and heart. It deserves a wide readership for it is well-written and tells of a Michael Jackson who gave thousands to charity work around the world, who would sit with gravely ill children to comfort them, who was loved by leaders like Nelson Mandela for the good deeds Michael felt he was on this earth to accomplish. Too bad that most people think of Michael Jackson as a bizarre person, associating him and his estate Neverland with perversion. Gifted, good and otherworldly? Yes, Michael Jackson most definitely was. THE BEST book available on Michael Jackson! I have collected shelves of books on & about him through the years & many more since his death, but this one is by far the best! Dr. Moriarty has made him a man, not just a name or a performer & I hope that thousands will buy this book and read it. EVERY Michael Jackson fan needs to read this fantastic book. It will open your eyes, make you think, make you cry and make you smile. I believe you'll find this very informative, and even includes an Epilogue about the death and trial of his doctor. … BRILLIANT!! This book is a must read for all of Michael's fans around the world, and for readers who will discover the unique person he truly was. I cried for the world's loss … you will too. Great book: read it!!! … From the opening lines of her tribute, Moriarty uses her book exactly as the title indicates: she sets out to defend Jackson's seemingly eccentric traits and what some perceived during his lifetime as odd behavior.... His bizarre behavior fit his bizarre life circumstances, she says, and no matter how people perceived his behavior there was nothing unseemly or sordid about it. If you want an eye-opening portrayal of the real Michael Jackson – delivered in a rare blend of disclosure, respect, insight, and passion – this is it! When considering the myriad of books, articles and television programs that have been released since Michael's passing, some people may wonder if there's anything new or compelling left to be said about his well-chronicled, remarkable life. Well, I can assure you that Defending A King ~ His Life & Legacy will give readers something unique: a never-before-told, inside story of what daily life was really like for the world's most famous person. What Michael referred to as his "life in a fishbowl" will seem like an understatement when you've finished reading this exceptional book. I was extremely impressed with the depth and breadth of Dr. Karen Moriarty's research. She supports her positions thoroughly and thoughtfully in each of the 19 chapters. An emphasis on firsthand sources--including security staff and professional associates--adds a great deal of credibility throughout. Additionally, I thought the book did an excellent job of clearing up the lies and misinformation repeatedly spread by the self-serving media. The numerous examples given of Michael's random acts of kindness--often done anonymously--were both surprising and uplifting. I think the assertion that Michael was someone, "...with a heart as big as his talent" says it best. I highly recommend this book for anyone. You'll learn more about the global icon and legend, while also realizing more about the man. Michael Jackson changed history, and his influence is all around us. His one-of-a-kind life is worth understanding. As a senior citizen my idea of the King of Pop was Sinatra. My perception of Michael Jackson was built on media critics, video clips, and news of lawsuits. Dr. Karen Moriarty's biography has provided an amazing narrative of this remarkable entertainer and human being. Her detailed description of his life has totally changed the stereotype of a globally famous celebrity. A great read. … I am so so fascinated by this book.... Even if you have … managed to remain a non-fan of MJ …, this reading and subsequent understanding of MJ the man will make you an instant fan.... It was an emotional roller coaster for me. I must … give full credit to Dr. Karen Moriarty for her detailed research and for being able to provide more than enough proof against all those allegations that MJ has faced over the years. Closing the back cover, it is difficult not to see Michael in his totality, told from a place of understanding, love and truth.... I hope you decide to enter Michael's world through Karen's words and insight. She hopes we can cherish him even more. Most of these excerpts are from "Customer Reviews" on amazon.com.